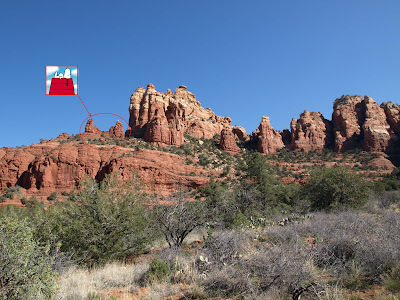 On one of out many winter escapes to Arizona's sunshine and warmth we decided to spend a few days in the Sedona Red Rock area. The purpose was a couple of days hiking and exploring. We landed in a reasonably nice hotel just along the highway that had a large room and deck outside with a brief view of the famous Red Rock. While you can’t see the Rock from this camera angle this was our deck for a couple of days. Some of the Indian legends say that these strange stone formations are really the frozen bodies of their ancestors. Looks like strange rocks to me. The creek lead us to some interesting formation where the water had eroded holes and swirls in the soft sandstone. As we got closer to the rock cliffs we ran across a couple from Germany just sitting on a stone enjoying the serenity of the beautiful Sedona countryside. We struck up a conversation with them. They came here every year to bask in the mystical properties of the Sedona area for a couple of weeks. They seemed to know a lot about the area and eventually we learned that we were very close to a well known local landmark call Snoopy Rock. It seems that if you look from the east or the west at the rock bluff we were approaching and used a bit of imagination… Well alright a lot of imagination you can see the outline of Snoopy laying on his dog house at the tip of the bluff. A little closer. Can you see the grey rock that is the tip of his nose? Looks like there is a trail up there. We had better go check out Snoopy close up. Hey you didn’t expect we could actually do a hike without climbing up on something high did you? The view is starting to get a little better as we move up the side of the bluff towards Snoopy. You can see strange lava formation down on the valley floor. Does it look like Snoopy yet? A much closer view of the frozen ancient Indian ancestors. Not sure what this is, but its interesting.